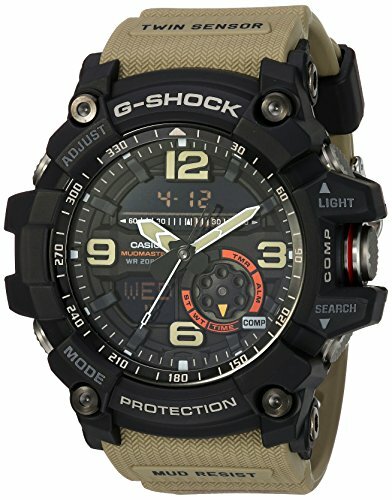 Built to withstand rough and muddy work, the watches in Casio G-Shock’s Mudmaster line are built to keep dirt and mud from harming button functions. The timepiece has multiple gaskets are used on the pipes to guide buttons and shafts, effectively keeping mud out. Twin Sensor functions allow the wearer to check temperature and direction while under tough conditions. This watch also features a high-luminosity LED backlight and it fits securely and comfortably with a desert tan khaki, resin strap.